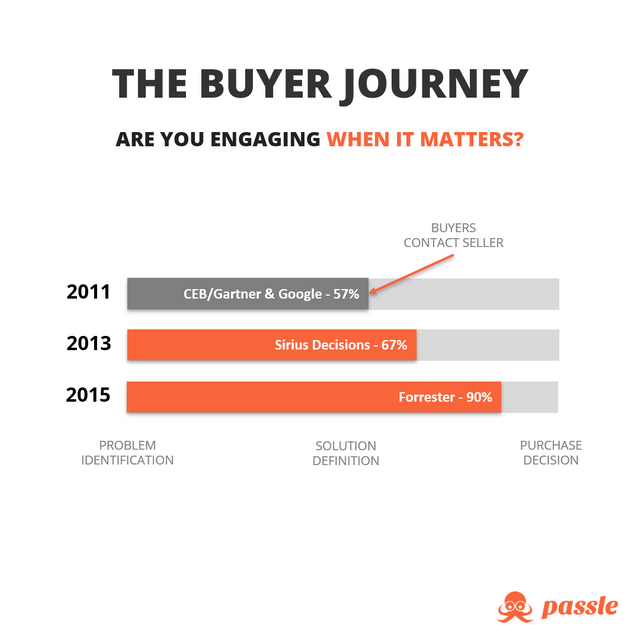 The Buyer Journey - when should you be engaging with your customers? As buyers have gained more and more access to information, they’ve begun to make more of their buying decision before reaching out to suppliers. But how far through the process are buyers before they engage with sellers and what does that mean for sales & marketing? There's been a lot of research on the topic, but it often disagrees and is often not measuring what you might think. I took a look at the most reliable stats available to find out when buyers are actually ready for sales and what selling organisations can do to engage buyers when it matters. A basic buyer journey looks like this. Some models differ but generally, they all include the following steps. Some models include post-purchase activities like retention and advocacy, I’ve not included them as they aren’t part of the initial buying journey. So let's take a look a the research around this journey and where buyers are reaching out. Our first data point comes from an older survey conducted across 1500 decision makers in 22 major companies. So a rather small sample of companies on offer, but all good examples of buyers. Each of the decision makers had recently been involved in a significant purchase decision. Interestingly, in this study, although the average was 57%, the soonest that any of the organisations reached out was 45%. CEB & Google firmly place buyer outreach toward the end of the solution definition stage. Meaning that buyers have already defined their problem and what they need to see from sellers - so when they are reaching out to you, buyers are probably reaching out to someone else as well. In 2013, Sirius Decisions looked at the buyer journey. Their figure of 67% appears similar to the CEB & Google data. Self-directed learning and evaluation make up at over ⅔ of the buying journey according to Sirius. Interestingly, Sirius does not separate the two parts of the buyer journey into before seller outreach and after seller outreach. They simply looked at how much time buyers spent researching themselves. The takeaway from this is that sellers should be guiding the buyer towards content that they can digest themselves - make the online research as easy as possible for them and continue to build trust, value and positioning for your offering whilst you are out of the room. I see these Forrester numbers quoted in a number of places, most notably by Forbes and HBR. Finding the original study from this has been quite difficult and it actually appears that the quote is taken slightly out of context from another piece by an individual analyst. So I won’t be lying awake at night worrying about this figure. The information from Forrester is one more contribution however to an industry trend that B2B Marketers need to take advantage of. Buyers clearly have difficulty understanding their problem in the first place, finding possible solutions and selecting vendors that can solve their issues - especially a vendor that can meet all the elements of their requirement. 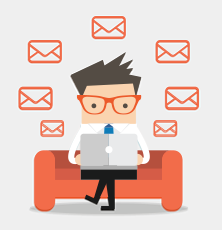 An oft-quoted stat from Forrester is that buyers engage with 11.4 pieces of content before engaging with sales. The difficulty buyers are having is large enough that they are investing a lot of their time getting it right. The decision making mountain buyers have to climb is 11.4 pieces of content high and several vendors wide. Sellers that can establish a credible reason why they should be involved in helping buyers to understand their problem will be involved sooner than buyers that cannot. That involves having tangible value to add and insight into the buyer's problem that saves them time and is expert-led rather than “marketing waffle”.